Michael Abella made his first appearance in District Court yesterday after crashing his car Sunday at Honolulu Airport. The man who crashed his car Sunday through the interisland terminal at Honolulu Airport was depressed and confused before the incident, his family said. Michael Abella, 26, was arrested for suspicion of operating a vehicle under the influence of an intoxicant, driving without a license, and an unrelated traffic warrant after crashing his car through glass doors on Sunday night, police said. He appeared in traffic court yesterday, where his estranged wife waited to ask him what happened. "I don't know if he was trying to hurt himself or what," said Donna Abella, who has been married to the suspect for three years and has a 3-year-old daughter with him. "He's not violent towards others. He's just not in his right mind." Donna Abella said she last saw her husband on Friday night, when he came to her mother's house to ask to see the couple's daughter. But Abella was told to leave after being reminded that his mother-in-law had won a temporary restraining order against him. "He came to the house. ... My mom called the police. ... He left," said Donna Abella, who has been separated from Michael Abella for about three months. "He seems confused about things." Abella rammed his car through glass doors and drove about 100 yards through the Hawaiian and Aloha airlines baggage claim areas as security guards yelled for him to stop, witnesses said. State Department of Transportation officials met yesterday to discuss possible changes to safety measures. "We have stepped up security at the lower-level baggage claim area of the airport," said Scott Ishikawa, a DOT spokesman. "We have more security personnel assigned to the area. However, we're still mulling over whether we should put in barriers, because we're trying to provide accessibility at baggage claim." According to Department of Public Safety officials, Abella appeared to be under the influence of something, and officials are now awaiting toxicology reports. "He was given a Breathalyzer and he tested zero for alcohol, but the toxicology report will take a few more days," Public Safety spokesman Mike Gaede said. Abella appeared in District Court on the charges yesterday afternoon and was released after posting $975 bail. 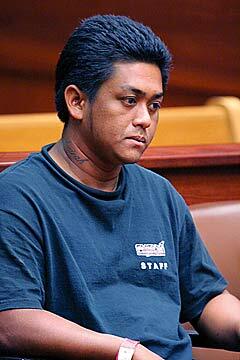 Abella, a detailer at a Nimitz Highway car dealership, is expected to appear at a Family Court hearing tomorrow to determine whether a temporary restraining order filed against him will be extended. Family Court Judge Jennifer Ching issued the order on Oct. 14. It is set to expire Jan. 12. Donna Abella would not give details about the restraining order against her husband. But according to court files, Carolina C. Hernandez requested the no-contact order alleging that she is in immediate danger of being physically and mentally abused or her property damaged. Hernandez wrote that Abella punched and broke her screen door, slammed doors in the home and threatened to break the window of her car. Abella abuses alcohol and drugs but refuses to get help, Hernandez alleged in her petition. Abella was served with the order on Oct. 15 with instructions to return to court tomorrow. Star-Bulletin Debra Barayuga contributed to this report.